Including training software World Tours 2.0! The Kettler exercise bike Racer 9 incl. Kettler World Tours 2.0 has been developed for cyclists, who attach a great importance to an indoor training, which is quite similar to a real cycling tour! The innovative training software Kettler World Tours 2.0, which is included in delivery, provides an almost unlimited training variety on realistic training courses. The Racer 9 racing exercise bike concentrates on the essential factors of a racing exercise bike: Workmanship of highest quality and maximum authenticity. No matter what's the weather or the time, you can work out with the Racer 9 exercise bike of Kettler, whose wear-free induction brake system generates resistances of up to 1000 Watt. In addition, this high-quality brake system allows to change between speed-dependent and speed-independent resistance generating. In the speed-independent zone, resistance from 25 to 600 Watt are realised; in the speed-dependent zone, you can realise resistances from 25 to 1000 Watt. A very special highlight of the Racer 9 exercise bike presents the electronic gear shift. In the speed-dependent mode, the pedalling resistance is adjusted via the electronic gear shift instead of the Watt levels. Virtual chain wheels (in front) and sprockets (at the back) can be chosen via the gear shift on the handlebar of the racing cycle Racer 9, so that you can select from all in all 20 different gears. 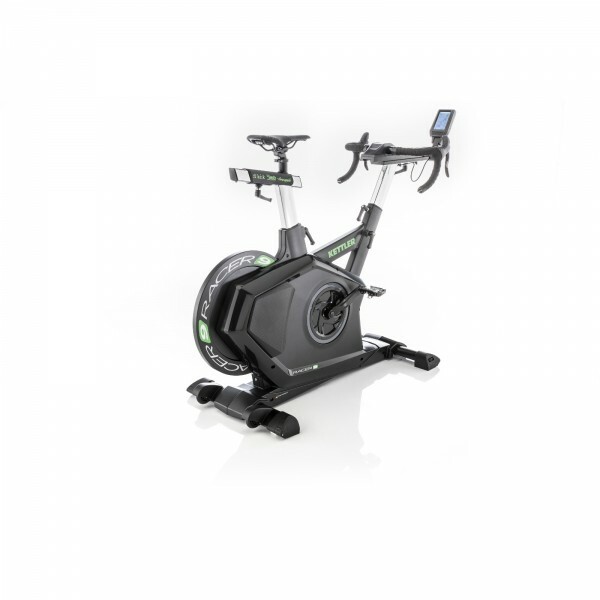 The intelligent induction brake system of the exercise bike Racer 9 responds to a change to a higher gear with a short-term increase in the load by 25 Watt. That's how you experience a real racing bike feeling when you change the gear. Thanks to the practical quick-release system, the Kettler exercise bike Racer 9 can be quickly and mainly infinitely variably adjusted to your req uirements. The sporty saddle and the versatile racing bike handlebar with Campagnolo Chorus gear handles provide high ergonomics during the training and a dynamic movement experience. The integrated Bluetooth interface of the Racer 9 makes a training with the innovative training software Kettler World Tours 2.0 possible, which is included in delivery. This special software allows you, among other things, to compete against friends or other persons in races or to plan and to cycle own tours on realistic courses. Kettler exercise bike Racer 9 incl. Kettler World Tours 2.0 add to comparison list.